This recipe starts off with some seasoned slow roasted tomatoes (or you can char them like Camilla did in her recipe). Then, they’re blended up with a kick of spice and some pickles for good measure. After that it’s all about the toppings! And these are Bloody Marys, so you gotta load ‘em up! Then, of course, there’s the slider – because slider! On a Bloody Mary!!! 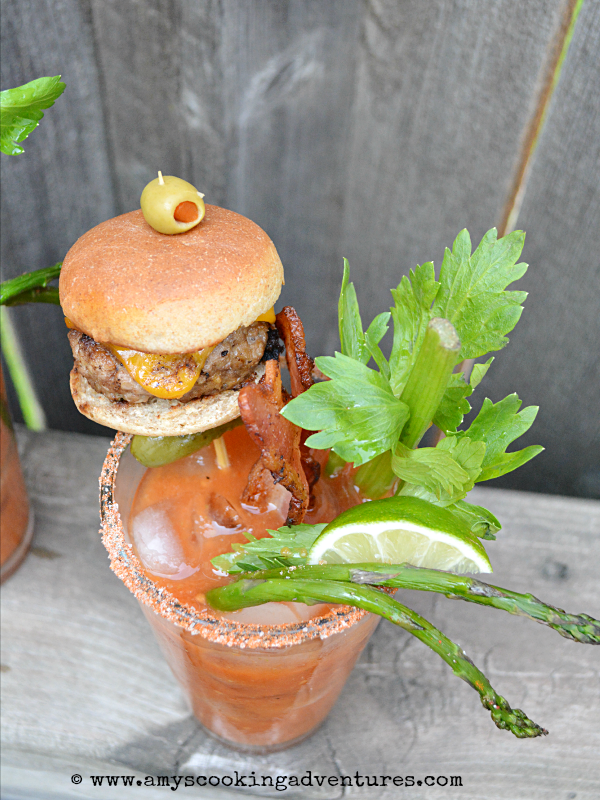 I worked in some of the flavors from the Bloody Mary mix into my burger for a little additional cohesion and skewered that slider onto the drink! Thank you, Camilla, for such a wonderful inspiration! Preheat the oven to 325 degrees F and line a baking sheet with parchment or a silicone baking mat. Place the tomatoes on the prepared mat. Drizzle with olive oil and sprinkle with smoked paprika, chipotle chili, salt & pepper. Place in the preheated oven and roast until the tomatoes are tender and just beginning to brown, about 40 minutes. Remove from the oven and cool. Once cooled, peel and discard the tomato skins. Place the roasted tomatoes, dill pickle, celery salt, ground mustard, sriracha, and Worcestershire into a small food processor or blender and process until smooth. Transfer to a bowl and refrigerate until ready to use. (Note: yields approximately 1 cup, may be made a day or two in advance). To make the sliders, heat some bacon grease in a large skillet over medium heat. Place the beef, bread crumbs, egg, salt & pepper, Worcestershire, garlic, and parsley in a bowl and mix until well combined. Split the beef into about 14 small patties, leaving a small divot in the center of each to ensure even cooking. Cook the patties in the prepared skillet until done, flipping once. Melt cheese on the patties in the last minute of cooking, if desired. Place the patties on toasted buns. To create the Bloody Marys, run a lime along the rim of 2 glasses and press through the salt mixture. Fill glasses with ice. Split the Bloody Mary mix between the glasses and top with 2 ounces of vodka. Garnish with a celery stick, roasted asparagus, bacon, pickles, olives, and sliders! 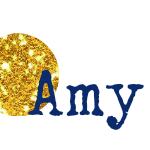 Amy, this is so clever!! What a great looking Bloody Mary!! Oh, I LOVE this. Thanks, Amy. I completely forgot about this recipe. Yours looks amazingly delicious. I can't wait to make these again. This is so creative and adorable. And it looks delicious! I want one even though it's not 8 am here yet! 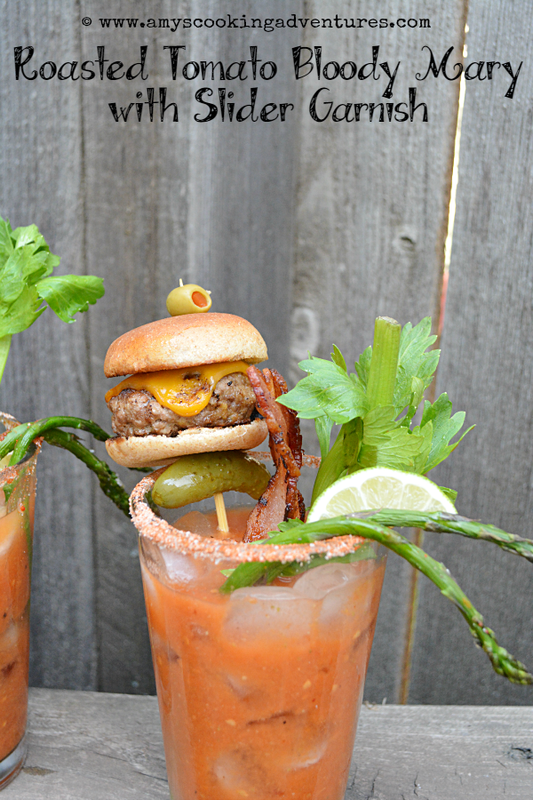 We would love the Virgin Bloody Mary and the Slider is a great garnish, this is a great presentation and your photos are outstanding. It has been fun cooking with you in the SRC! Wow! That is the best Bloody Mary I have ever seen! (Incredible photos!) Bloody Mary's are one of favorite drinks anyway and then you topped it off with an out-of-this-world looking slider and I was hooked. Great choice for SRC and I agree - Camilla is a genius! Oh my gosh. This picture. WOW - what a clever idea!!! This has to be the most fun post ever! What a Bloody May..... I love this drink and with a slider..... WOW!!! Great SRC selection.